Experience ice climbing in one of the best climbing areas in Hokkaido, Japan: Jozankei, located near the city of Sapporo, with IFMGA certified guide Takao. Enjoy the ice falls of Jozankei in Hokkaido, Japan. Conveniently located only an hour away from Sapporo. Spend a full day in the area, admiring the scenery while enjoying the climb. Another one of the beautiful ice climbing spots in Hokkaido, Japan, Jozankei is a delight for anybody who loves great climbing. 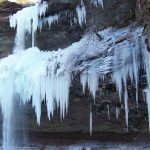 For a full day, I would like to guide you along the beautiful ice falls of Jozankei. Located only an hour away from the city of Sapporo, the available ice falls in the area are amazing. Also, the area around them is truly stunning. Thus giving you an all encompassing experience that involves fun, excitement and fantastic views. While only twenty meters high, the ice fall at Jozankei is nonetheless measured at a technical level between W3 and W4. 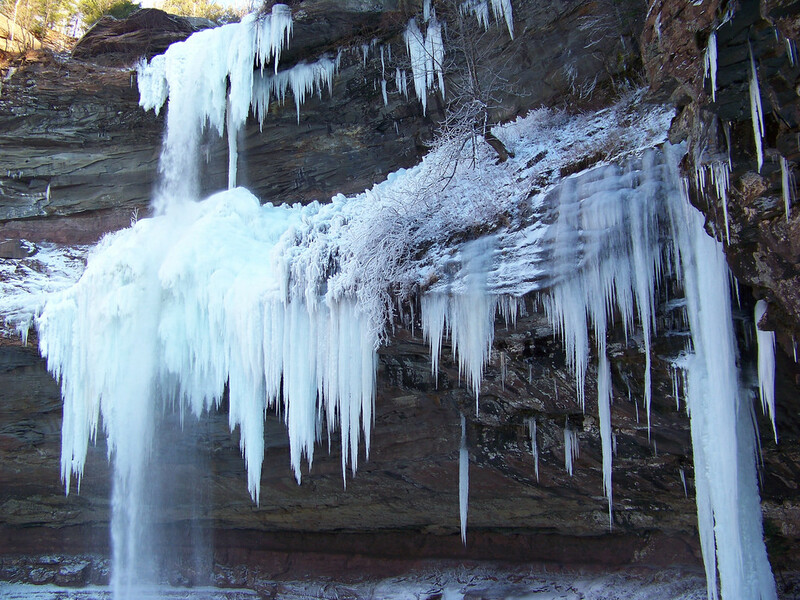 There are also two additional ice falls in the area as well, which will add to both the variety and the fun. Due to the length of the trip and the closeness to Sapporo, this ice climbing trip makes for a great addition to any vacation you may be taking in Hokkaido. Some ice climbing experience is recommended. However, you do not need to be an expert climber to enjoy this trip. But you should be in good physical condition, as ice climbing can be arduous, no matter the height of the ice fall. Yet another one of the wonderful ice climbing sites in Hokkaido, Jozankei is a great place to spend a day. If you would like to experience it for yourself, just send me a request. I look forward to guiding you. I can also take you climbing at Bifue, which is also near Sapporo. Along with the guiding fee, the price also includes transportation costs. Recommended accommodation options in Sapporo include the Route Inn Sapporo and the Sapporo Aspen Hotel, which cost 8,000 to 9,000 JPY, but does not include food. There is also the Sapporo Grand Hotel which costs 10,000 to 20,000 JPY. Participants on this trip must bring their own snowshoes and poles. I am an experienced IFMGA mountain guide, born and raised in Hokkaido, Japan. I started skiing when I was 3 and started climbing when I was 6. My high school years were spent in ski competitions and I joined mountaineering club at University, where I developed my ski mountaineering skills. I have been a ski instructor for Miura Dolphins founded by Yuichiro Miura (first ski descent of the Everest “The Man Who Skied Down Everest” and the oldest Everest summiting record holder at 80 years old) and also supported Yuichiro's Aconcagua ascent and ski descent in 1984 as a part of his 7 summits ski descent challenge. 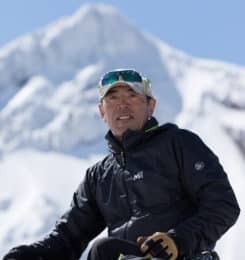 I was inspired by the works of mountain guides in Chamonix when I visited there in 1983, and decided to start guiding as a mountain guide in Japan in 1989 to share my passion and experiences in outdoors sports with other people, as well as to offer instruction to people enjoying the mountains to be better climbers / skiers. I have also contributed to the proper training of JMGA (Japan Mountain Guides Association) guides and the affiliation of it to IFMGA. I am responsible for the pioneering of the climbing and backcountry skiing scenes in Japan. My main guiding arena is alpinism, whether it be mountaineering or ski mountaineering, mainly in Hokkaido. I usually take a small group of people (2-5) for Sawanobori (canyoning up waterfalls), alpine climbing, ice climbing, and ski touring in the more remote areas of Japan. I enjoy finding the best experience for each client accordingly to their physical abilities, preferences, and weather/conditions. I guide because I like watching and feeling that people are enjoying and having fun, and see how this buzz infects other people through skiing and climbing. I find this invaluable as a mountain guide. There is more to Hokkaido than skiing lift accessible powder in January and February. Please reach out to me to find your own customised way to enjoy Hokkaido’s mountains, natures and culture!